NHL.com periodically will be doing a series called "Five Questions With…," a Q&A with some of the key movers and shakers in the game today, aimed at gaining some insight into their lives and careers. Joel Quenneville has two Stanley Cup championship rings separated by 14 years. 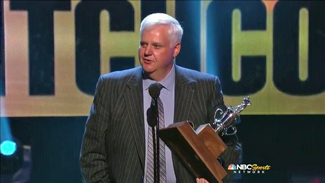 In between winning the jewelry as an assistant with the Colorado Avalanche in 1996 and as coach of the Chicago Blackhawks in 2010, Quenneville won the Jack Adams Award as coach of the St. Louis Blues. The rings and the coach of the year award highlight Quenneville's nearly two-decade career behind the bench in the NHL, but further evidence of his longevity comes in the form of various other numbers. "Everybody warns you, this and that, but you're thinking and hoping that you'll just get through it. It took a while for us to get going." 1,163 -- Total games as a head coach in the NHL (10th all-time). 624 -- Total wins as a head coach in the NHL (7th all-time). .604 -- Quenneville's career winning percentage. Moreover, Quenneville and Jacques Lemaire are the only people to have coached more than 1,000 games and played more than 800 games in the NHL. Now that you have the facts, read on for a little slice into Quenneville's coaching philosophy and his favorite hobby away from the rink. It has been 16 years since you were an assistant and won the Stanley Cup with the Avalanche, so with so much time gone people may have forgotten you had a long playing career too. How did your 13-year playing career in the NHL influence your philosophies as a coach? "I had a lot of experience playing for different coaches and got familiar with the way the game was being played, and what was needed and necessary for players to be successful and for teams to be successful. That helped the approach of looking at and assessing how your team has to play and how to get the most and max from every single player. I played with a lot of coaches and you learn a lot from each one." How, if at all, has your approach changed from your stints in St. Louis to Colorado and now to Chicago? "At the end of the day you've got to be yourself. You adapt to the way the game is being played, the speed, the quickness, the way the other team forechecks and plays in their end. Everybody has different ways of pressuring and being patient. You can fluctuate over the course of the season based on the success your team is having. But I like to play an up-tempo type of game. I like an attack game. Sometimes you change based on the team you have, so being flexible to the way the game is played today is important. "But as far as how I am, I'm consistent. Referees may think I've mellowed out a little bit, because sometimes you may be able to have a bigger impact than standing on the bench, waving your arms around and looking like an idiot." What was your come-back-to-reality moment after winning the Stanley Cup with the Blackhawks? "The reality moment is when you start the next season and you know how tough it's going to be. We had a tough start right off the bat, lost several home games right out of the gate, and we were a .500 hockey team. Everybody warns you, this and that, but you're thinking and hoping that you'll just get through it. It took a while for us to get going. When you're .500 you're wondering, 'Can you get back to that level?' We did have a nice run at the end of the year, but right off the bat, that month of October, it was tough to get back to being an elite team. We figured it out that it wasn't going to be easy." You went to Chicago as a pro scout. Four games into the season you replaced Denis Savard as coach. Did you take the pro scouting job with the Blackhawks thinking you may one day be the coach of the Blackhawks? "I was thinking I was going to be a pro scout for Chicago. I was happy with that at the time. I went through the process over the summer looking for opportunities to coach and my aspiration was to coach, but at the same time I was content with being patient. I didn't see it coming at the time I took the job. It was a situation where things worked out because I inherited a terrific team at the right time. They were on the right path as far as progression and expectation. They had skill, talent -- all the ingredients to be a successful team. I was fortunate to be there. But I would have been very happy to be in Colorado for the year. I was going to take that year to watch Denver University, Colorado College and watch the Avalanche play. That was where I was at. I did not anticipate it changing right off the bat, basically." On a personal level you are an avid horse-racing fan. How did you get into it and what's your favorite racetrack? "Well, I grew up in Windsor [Ontario] and we had harness racing in Windsor. We liked going to Windsor Raceway sometimes on a Tuesday afternoon after getting out of school early. We weren't regulars, but we would go once in a while. I started following the thoroughbreds and I met some people in the business. It's fun watching them succeed, and I love the competition with handicapping the winner of a race. I think the animals are spectacular animals and athletes. They're beautiful to look at. Whether you're in the walking ring or watching on a television set, you've got to appreciate what they do. But the whole imagery is fascinating. There are so many variables that go into it. The game is just fun to watch. Sometimes you're good and sometimes you're no good. Right now I'm no good. "My favorite track is Saratoga [N.Y.]. I've been to all of them and Saratoga is my favorite, but I think Arlington [Ill.], from a pure racetrack, is probably the most spectacular one in the country. Saratoga is just a fun place. I've still got my season tickets and I go every year. I have to get my fix there. I enjoy it."